If you learned to drive during summer, chances are that you won’t have driven in snow before. The main issues with snow are that it reduces the friction between your vehicle and the road, and can block roads. Ideally, if you don’t need to drive, you shouldn’t drive, but if you have to make your journey these 15 tips will be invaluable. Check the exhaust pipe is clear first, then start the engine. Then clear your windows. Start blowing air on the windscreen and turn the rear demister on. Even though it will be initially cold, it will soon be much warmer than the ice that’s frozen to the screen and will help you dislodge it. If they are fully iced over you will need to wait until you can either clear them using a scraper, or pour cold water on them (not hot – this could crack the windscreen), or the air vents do enough melting that your windscreen wipers can clear them. 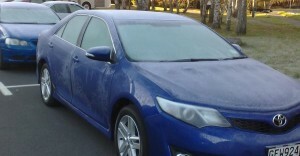 If you know there’s going to be a frost you can put newspapers or cardboard on your windscreen the night before, held down by your windscreen wipers as this will keep them clear. Once the ice is clear you still need to be sure you can see properly. Don’t start driving if the windows are still foggy, even if it’s just the side windows as you will need to look over your shoulder to change lanes, or at junctions. Clear your wing mirrors and any snow off your bonnet and the top of your car so it doesn’t blow back on your windscreen or cars behind you. Clear snow out of the radiator so it doesn’t block air flow. Balancing your speed can be difficult in snowy and icy conditions, especially if there are hills. In the case of steep hills then you may need snow chains. If you don’t have snow chains you will need to maintain enough speed as not to lose momentum, but not so much speed that you won’t be able to stop. Try not to park facing uphill or you may find it difficult to move away unless you have a four-wheel drive or snow chains. If you park on a steep hill, this may cause problems as your vehicle could slide uncontrollably once you start trying to move it. Be careful of where you park on ordinary roads. Snow will reduce visibility so even though you might be parking somewhere completely legal, you should consider whether your vehicle might actually pose a risk to other drivers. Before you reach a downhill stretch, slow down and change into a lower gear. It’s important in an automatic car that you manually select a lower gear. Try to avoid really steep hills. Leave much longer stopping distances. The coefficient of friction on ice can be 5-10 times less than dry tarmac. You should at least be leaving 4 seconds behind the car in front, and preferably 6 seconds or more. If your vehicle has a snow mode it can be useful for standing starts. Snow mode starts the vehicle in a higher gear so that there’s less chance of the engine’s torque causing the wheels to spin, and it makes for gentler acceleration. Use busier roads if you can. If you’re one for learning all the shortcuts, be aware that these may not have been gritted, or might even be impassable due to snow or ice. Main roads will have had snow ploughs or gritters through, plus the volume of traffic itself can help keep a road open. Let someone know where you are travelling to. This is less important in the city if you have a cellphone, but if you are travelling in rural areas where you might not be discovered if you leave the road, and there might not be phone reception, ensure someone knows your projected arrival time and the route you are taking. Keep a track of where you are, most importantly, what street are you on. If you do get blocked in or go off the road and have to call emergency services, they can locate you much quicker. Brake well before you take a corner so that you can have maximum grip in the corners. Watch for areas where puddles may have formed into ice (black ice), or areas which are shaded from the sun and therefore might still have ice even though the rest of the road is fundamentally clear. If you have to leave your vehicle to go and get help stand away from where you stopped or crashed as the next vehicle along the road could have the same problem you had. It’s not advisable to leave your vehicle if the weather is really bad unless you can actually see help, for example a house with lights on, or an emergency vehicle. Carry a kit with a blanket, shovel, torch, booster cables, traction mats, fuel line deicer, a warning triangle or other bright object to warn others, maps in case your smartphone maps won’t work and a bag of sand to help with traction or defrosting ice. Take water and food with you for a longer journey. Keep your vehicle fairly full of fuel. If you do have to stop and want to keep your engine running to keep yourself warm and so that you don’t run your battery down with your hazard warning lights then you don’t want to be running out of fuel. If you have stopped because the road is impassable, try returning the way you came. If you are snowed in and with a passenger, take it in turns sleeping or you might miss rescuers. If you are on your own, tie something visible to your aerial in case the snow drifts. 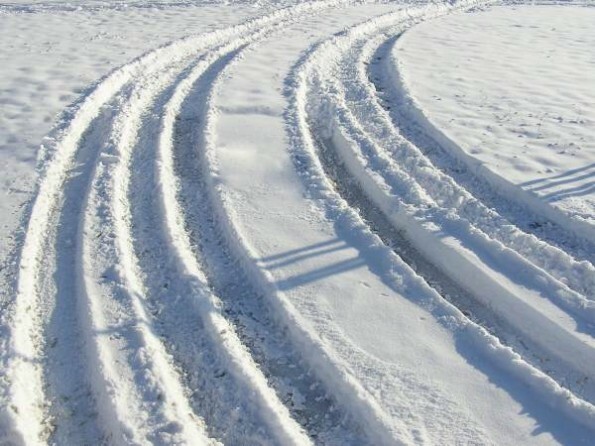 Ruts that develop in snow can make it very difficult to steer, especially if you need to get out of the rut and into your driveway. You may have to stop and dig a channel.